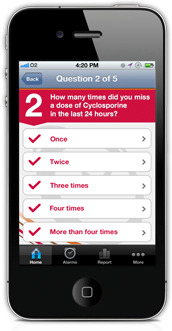 We have experience of designing and developing mobile apps for medication adherence & reminder purposes. We can offer a bespoke medication adherence app design solution for pharmaceutical organisations looking to produce specific medication adherence guidelines and reminders for patients taking their medicines. 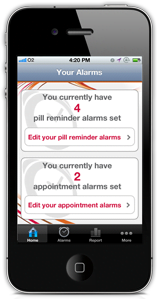 The medication adherence app example below needed to work as an alarm to remind patients to take their tablets on time and also to record the symptoms the patient experienced since taking their last dose of the medication. It would also act as an appointment reminder, incorporating the symptom information submitted by patients and combining multiple choice questions designed to produce a pre-appointment report for the GP to maximise the patient’s appointment time. Working with the client we developed a solution that will not only help patients with their drug adherence but will also maximise GP consultation time. We were also able to help them identify possible barriers during the development and ensure that ABPI compliance was considered throughout the process.